Mary Cassatt inducted into the Hall of Marys! It has been too long since my last post, and way too long since I inaugurated the Hall of Marys. Today is Mary Cassatt’s birthday and I can’t think of a better reason to break my online silence! 1) She pursued her career in art despite objections from her family and the sexist attitudes of her male peers. 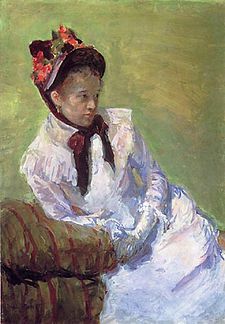 3) She was one of 3 women and the only American to exhibit with the Impressionist group in late 19th century Paris, which members included the likes of Degas, Monet, Renoir, and Pissarro. 4) She was a badass feminist who didn’t conform to the expectations the male dominated art world at the time–didn’t flirt her way into art shows, didn’t get married, and supported her art through her own work. 5) and too many other reasons, which you may feel free to add! This entry was posted in Hall of Marys and tagged Hall of Marys, Mary by Mary Keenan. Bookmark the permalink.